OWEN SOUND, Ont. — Sometime when you’re on the way to Owen Sound and you’re passing through Chatsworth, take the first road running west and head back north again on the third road to your right. Drive a few miles and keep your eyes peeled on the right side and you’ll see something pretty neat. A 1964 Model B61 Mack tractor up about 60 feet in the air, mounted on a steel cylinder, high above the pastoral farmlands of Grey County, Ont. 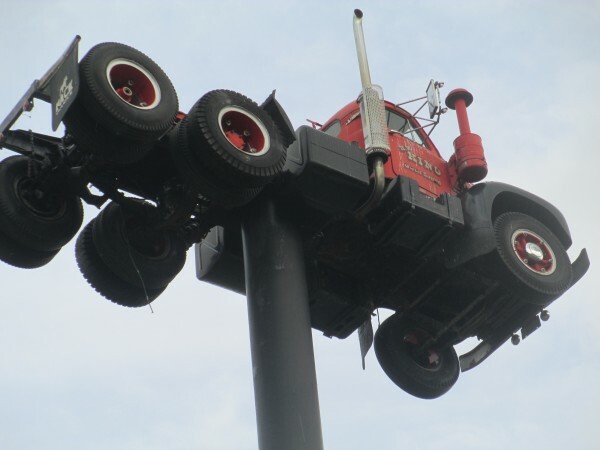 Legend has it pilots used the King Bros.’ Mack, mounted high atop a pole, as a navigational aid. I’ve heard that some Air Canada pilots use it as a navigation marker. But one thing is certain, when you see the “Mack on a Stick,” you know you’re in the King brothers’ territory. 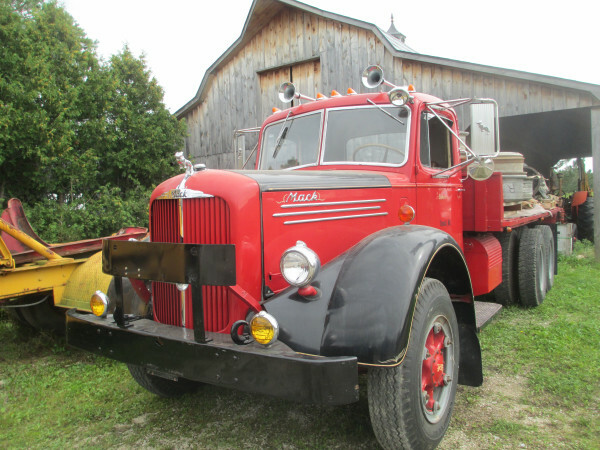 Wayne King has a collection of about a dozen restored ‘Bulldogs’ on the farm below the suspended B-61, and his brother Robert has his sizable collection of vintage trucks, mostly Autocars and a couple of Oshkosh snowplows, at his farm one concession to the north. The Kings are historical truck collectors and restorers. This is a special breed of trucker passionate about preserving and retaining a physical record of the trucks they drove and admired. And there is usually a strong familial connection. E C King Contracting was started by Robert and Wayne’s parents, Laurine and Elma, in 1946. 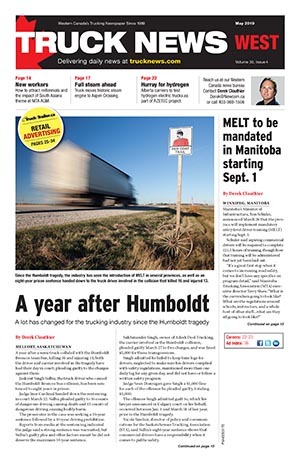 By the time the company was sold to Miller Paving in 1973, it was a thriving concern with 140 employees, five concrete plants, an asphalt operation, a quarry and several gravel pits. The family business may have been sold long ago, but its legacy of vintage Autocars, Whites and Macks lives on in the brothers’ collections. Robert has kept and restored the very first new truck he ever drove – a 1968 Ford – to mint condition. But one of his sharpest units is a 1956 Autocar that he spent 15 years restoring. Robert’s ’56 Autocar is no slouch on the road, powered by a 320-horse “supercharged” Cummins engine and a 5×4 two-stick Spicer transmission with overdrive available in both boxes. “I could hop in it right now and I know it would do a good day’s work for me,” he says. When truck restorers rebuild a truck, the result is usually superior to the product that rolled off the line so many decades ago. For many vintage truck enthusiasts, the annual truck show put on by the Antique Truck Club of America in Macungie, Pa. is a must-attend event, and the brothers frequently make the pilgrimage. The show usually includes a lot of Macks, as it’s just down the road from Mack’s historic HQ in Allentown. Robert usually makes the trip to Macungie using his 1984 Autocar as a power unit pulling a 53-ft. Talbert sliding axle trailer so he can float down a couple of his other treasures like his two Dodge Powerwagons, a 1949 and 1951. “I was once offered $50,000 for one of them at the show in Pennsylvania. A guy came running up beside us as we pulled in the gate,” he recalls. Robert and Wayne King flank trucking pioneer Ross Mackie. When brother Wayne has some equipment to move, whether to Macungie, or anywhere else in North America, he relies on his 1988 Mack Superliner. It’s a 15-speed with a 500-horse V8 engine that’s souped up – he’s polished the ports, redone the fuel system and added a 610-horse power turbo that was originally intended for a high-powered Australian Mack. “I can tell you that it puts out a whole lot more than 500 horsepower,” he says. For the most part, Wayne sticks to restoring Macks (although he has a WC 22 and a WC24 White in his shed). His first truck was a 4400 White but he drove his share of B-Models and was the first person in the Owen Sound area to bring home an R-Model Mack in 1966. Most of Wayne’s Macks are extremely collectible. Besides the highly coveted Superliners in his shed, he’s got a couple of LTs from the ’40s and an LJ as well as an F-Model. But Wayne thinks that the nature of historical truck collecting is changing. But Doug Grieves, a past president of the Antique Truck Society of Canada thinks there is still a place for the avid collector, even as prices for some vintage trucks have dropped. 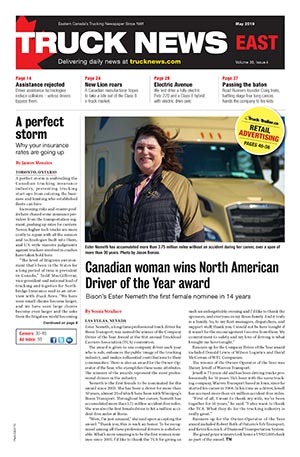 “Steven Proctor, one of the boys of Proctor’s Cartage, in his 30s now, grew up around trucks and collects Freightliners. He must have a dozen of them. 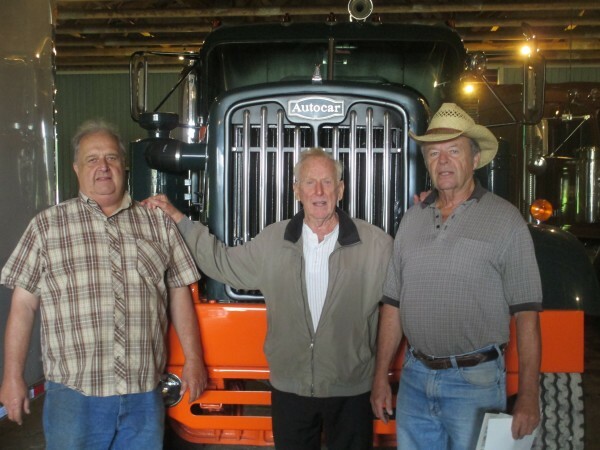 Ross Mackie just put his old 1964 Kenworth back on the road, and George Tackaberry has a crew rebuilding old trucks and putting up buildings to keep them in. It’s usually the companies who take great pride in their equipment, like the Kings, Proctors, Paddocks, Mackies and Tackaberrys, who are the most interested in historical trucks,” says Grieves. The Antique Truck Society of Canada had a good run in the 1980s, but has been in retirement for some time. But new players like the Great Lakes Truck Club are stepping up to continue the tradition of preserving our trucking history. The group’s annual truck show in Clifford, Ont., is well attended by enthusiasts and collectors alike. The Internet may have changed the world but it hasn’t affected the King brothers much. When Wayne and Robert are looking around for parts or a particular model or a truck, they put the word out to a few friends and collectors via their landlines, and often as not they find what they’re looking for. However, Wayne admits the phone calls from collectors are getting rarer these days, and good parts are getting difficult to source. The brothers’ collections are great, but I’m intrigued about the B61 sitting on a pole. What gave Wayne the idea to put it up there? “When we were kids our parents took us to visit some friends in Arkansas who owned a cement plant,” he relates. But getting a Mack tractor 60 feet in the air was an engineering feat, and one worthy of Cirque du Soleil to boot. and Robert King own a fascinating collection of classic Macks. That was 26 years ago. In those days, Wayne had the tractor electrified with clearance and running lights. It must have been quite a sight in the night sky. He recalls that a friend of his was working at the old PPG glass plant in Owen Sound and had taken off early and had a few drinks.